Hamburg, 09 July 2018: With a special category for integrated digital innovations in the field of air travel, the Crystal Cabin Award, the world’s leading prize for aircraft interiors and on-board products, is extending its scope. The new category is aimed both at passenger-focused products such as smartphone apps relating to air travel, and at digital applications that improve product management for airlines. Entries can be lodged online at connect.apex.aero/page/apexawards until the end of July. The new category is running outside the normal entry phase for the Crystal Cabin Award. It will be presented on 24 September together with the APEX Awards at the APEX EXPO and Aircraft Interiors Expo Americas events in Boston, Massachusetts. The application phase for the other eight categories, traditionally awarded every April at the Aircraft Interiors Expo in Hamburg, will then begin. “Best Customer Journey Experience” comprises all products that help to improve the customer experience journey (inspiration, planning, booking, purchase, pre-trip, departure, in-flight and post-trip) across airline travel categories. It includes technical end-to-end solutions across categories including applications, artificial intelligence, tools, devices, software, programs etc. The product should offer benefits for airlines, OEMs, and/or suppliers by offering new digital solutions and specific insights about passengers experience for the benefit of on-board technical utilization. The finalists and award winner will provide airlines and their suppliers an inspirational example on how to optimize the cabin for end-to-end travel solutions centered around personalized passenger experience. 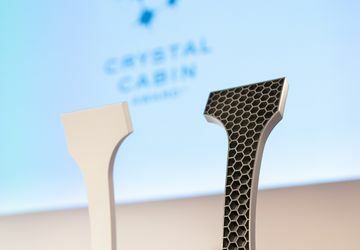 This special category complements the existing eight categories awarded each year in Hamburg for the Crystal Cabin Awards: „Cabin Concepts“, „Cabin Systems“, “Greener Cabin, Health, Safety and Environment”, “Inflight Entertainment & Connectivity”, “Material and Components”, “Passenger Comfort Hardware”, “University” and “Visionary Concepts”. Winners of the 2018 season included renowned industry players such as Airbus and Altran, Rockwell Collins, and PriestmanGoode with Qatar Airways. The Crystal Cabin Award 2018 is supported by the following sponsors and media partners: Airbus, Aircraft Cabin Management, Aircraft Interiors Expo (Reed Exhibitions), Aircraft Interiors International Magazine, AIME 2019 - Aircraft Interiors Middle East, ALTRAN S.A.S. Co. KG, Ameco Beijing, APEX, ATR, Boltaron Inc. – A SIMONA Company, DIEHL Aviation, FERCHAU AVIATION Division, FIT AG – Additive Manufacturing Group, Flightchic, Flightglobal, Future Travel Experience, Global Eagle, HAECO Cabin Solutions, Inflight Magazine, Jetliner Cabins, Lufthansa Technik AG, Panasonic, Rockwell Collins, Runway Girl Network, SEKISUI SPI and Thales. 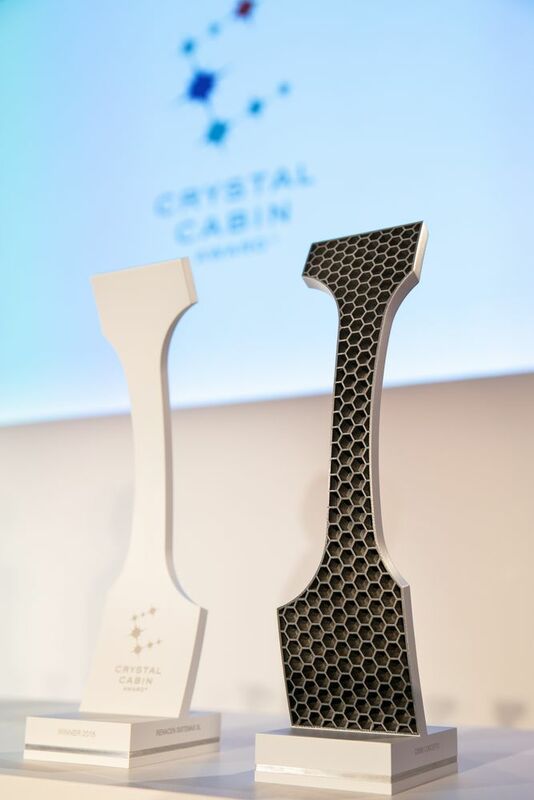 The Crystal Cabin Award is THE international prize for innovations in the field of aircraft cabins. A high-calibre jury made up of renowned academics, engineers, specialist journalists and airline and aircraft manufacturer representatives comes together under the slogan “Let your ideas take off” to honour extraordinary cabin concepts and products. The competition was launched by Hamburg Aviation and is organised by the Crystal Cabin Award Association. The award, to date the only one of its kind, has been presented as part of the Aircraft Interiors Expo in Hamburg every year since 2007. The trophies have become a seal of quality, known and coveted around the world.